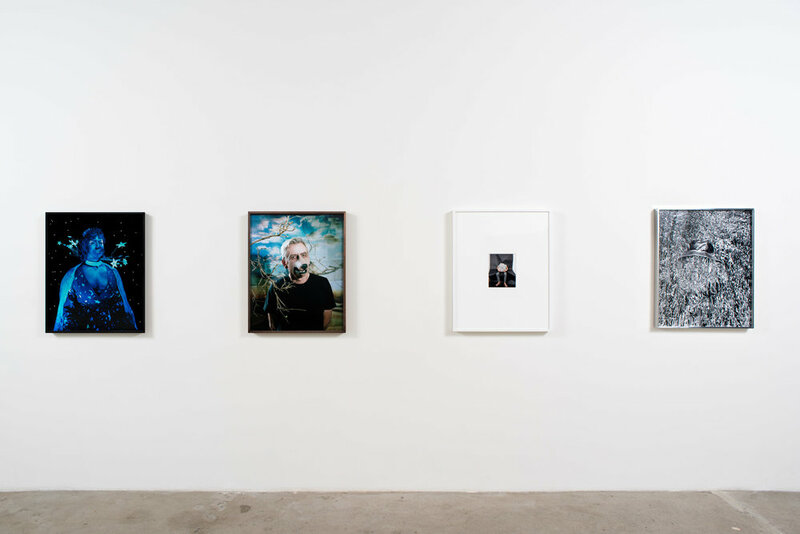 Moskowitz Bayse is pleased to present Space, Christopher Richmond’s second solo presentation with the gallery. New photographs, drawings, and sculpture accompany Hyperway (2018), the monumental three-channel feature-length video that occupies the east gallery. Hyperway evokes all that hyperspace promises. 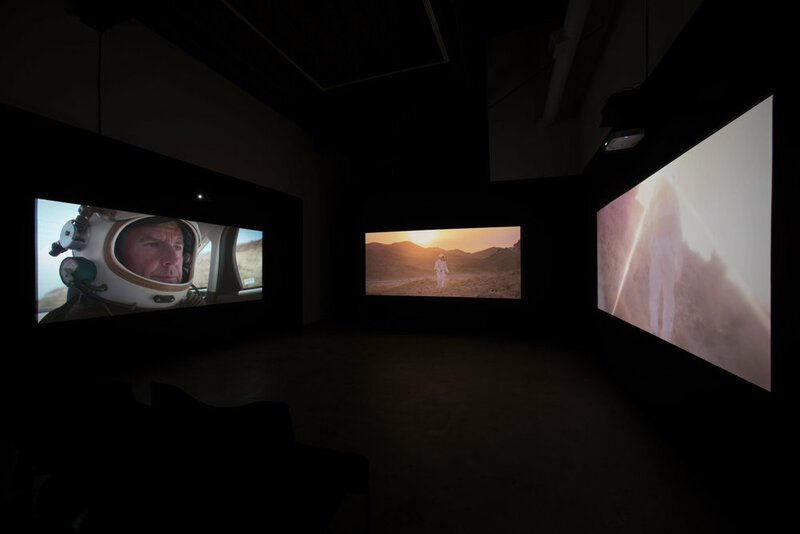 Astronauts depart on an intergalactic journey from Los Angeles to an alien world in an air-conditioned Honda Civic, taking them through California desert highways and exotic planetary landscapes. On this surreal odyssey, they explore and debate a diverse range of topics - What is the purpose of travel? What is an earthling? How does the artist Daniel Buren's essay, "The Function of the Studio," relate to interstellar travel? As their physical and mental transformation takes hold, imagination overcomes senses and becomes a reality. Simultaneously, a celestial being, billions of years old, questions the multiverse. A colossal asteroid hurtles past distant stars, foreshadowing a cataclysmic event. Richmond challenges viewers to envision alternative realities and to devise their own images and theories of the unknown. 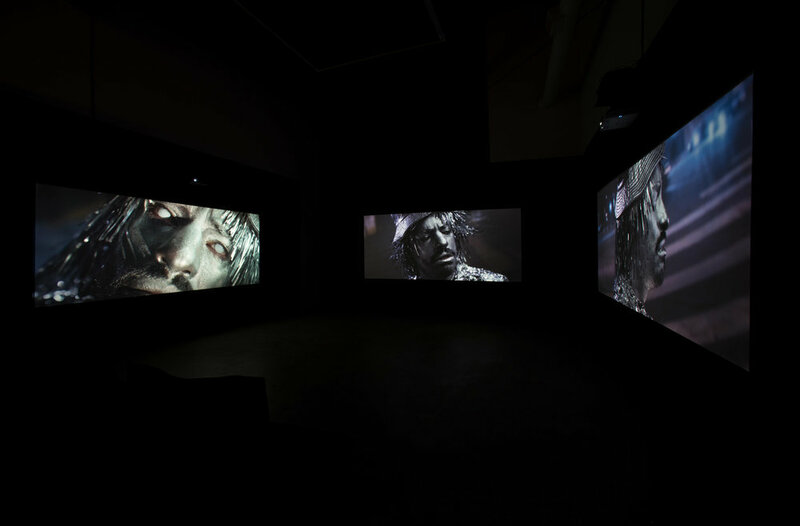 In his photographs, drawings, and sculpture, Richmond points to the various narrative strands of his video work. Black holes with gastrointestinal tracts swallow suns, wormholes create highways across space and time, and universes crash into one another like drunken eclipses. Like Richmond’s video work, his photographs, drawings, and sculpture obscure as much as they reveal. Viewing Stone (2018), a second new video work by the artist, will be the centerpiece of the exhibition Space 2, concurrently on view at DXIX Projects from November 18 through December 22. Viewing Stone glimpses a pastoral vision of a desolate asteroid serenely wandering through the vacuum of space. In a series of long slow-motion shots, the camera hones in on the contours of the asteroid’s perforated and wrinkled exterior. As shadows shift and transform its surface, a feeling of tranquility intermingles with foreboding danger. Throughout cinema, asteroids have been confined to apocalyptic symbols of impending doom. Here, the viewer is presented with a far different vision: the juxtaposition of reality and simulation, creation and annihilation, the beginning and the end. Like Suiseki, the Japanese art of stone appreciation, the asteroid is presented as a mystical creation like many of the characters in Richmond’s work, as it slowly travels through space. Rather than working from a script, Richmond writes a story and an outline, and allows the actors, professional and non-professional, to improvise on the central topics at the focus. Though this process results in a vast array of footage that never makes the screen, it allows for close and often reoccurring collaboration with a community of artists, writers, filmmakers, and musicians that shapes, twists, deconstructs, and reassembles in a reordering integral to Richmond’s practice. Hyperway stars Jan Tumlir, Christina Catherine Martinez, and Augusto Aguilera, and features an original score by Brandon Rolle and new music from Xina Xurner. Viewing Stone features new original music by Aileen Bryant. Christopher Richmond (b. 1986) earned his MFA from the Roski School of Art and Design at USC in 2012. 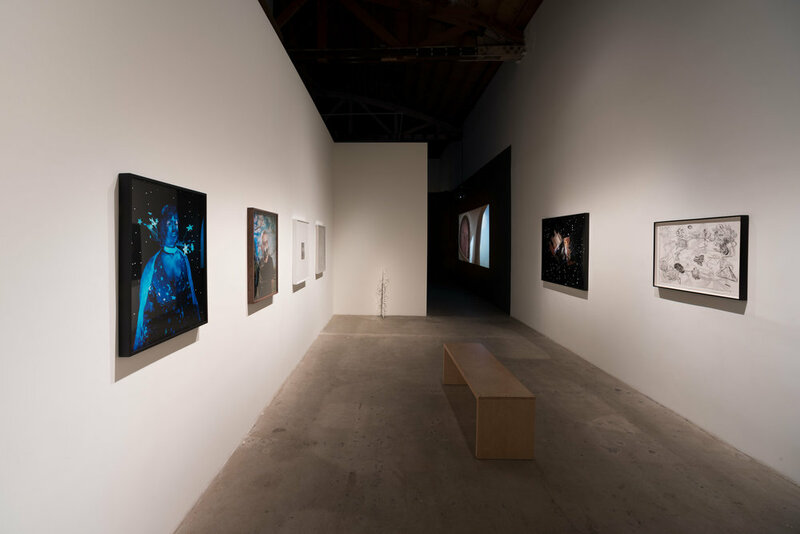 His video and photographic works have been widely exhibited in galleries around the world, and his work can be found in notable collections including the Los Angeles County Museum of Art (LACMA). He lives and works in Los Angeles.